Plate rolling machine is a kind of universal forming equipment to roll sheet metal into cylindrical, arc and other general shapes of the workpiece. It has been widely used in boiler, shipbuilding, petroleum, chemical industry, metal structure and mechanical manufacturing industry. Four roll plate bending machine is featured convenient center alignment, small surplus straight edge, high accuracy roundness correction, high efficiency as well as able to complete pre-bending and workpiece forming in one-time rolling without switching the plate end. 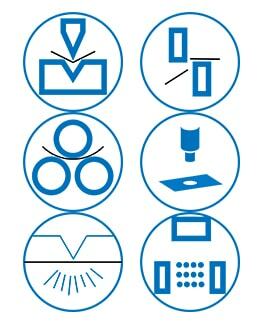 It occupies an increasingly important position in sheet metal forming. The roll bending force condition is relatively complex during the working process of four roller plate bending machine, and it bears a great load which requires the bearing parts has enough strength and rigidity. Therefore, precise and reliable design of plate rolls is necessary. 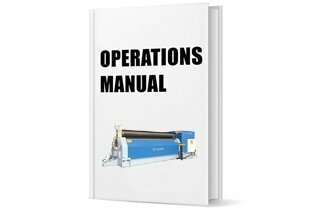 First, the force parameters of the roll bending machine need to be confirmed, such as pressure on the roller, bending torque, and motor-driven power. The load analysis of rolling machine can be reference data for designing parts of plate rolls. 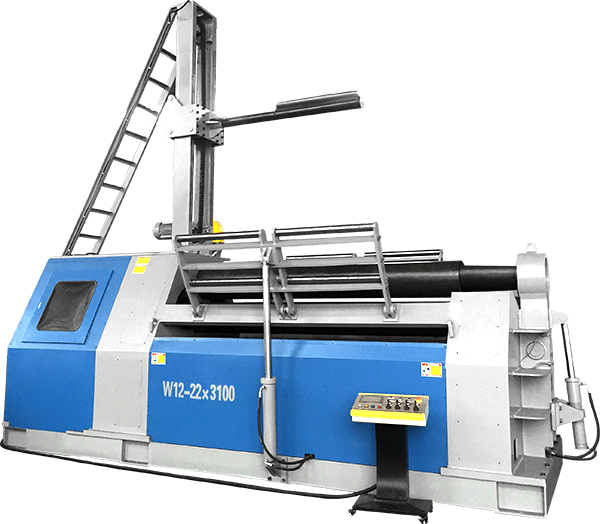 The calculation of the main driven power of the plate roll bending machine is the key reference data for choosing the main motor. The motor power should be chosen properly. If too small, the motor will be overload for a long time which will damage the motor because of heat caused by insulation. If too large, the output power cannot be fully utilized which will waster the electricity. Therefore, to do load analysis and improve driven power calculation of four-roll plate bending machine have important practical value for choosing a proper motor. 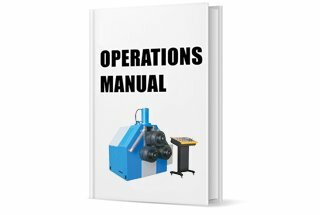 In this post, we not only introduce the basic structure and working principle of four-roll plate bending machine but also analyze the force capabilities based on that and finally get the calculation formula for main driven power of four rolls bending machine. 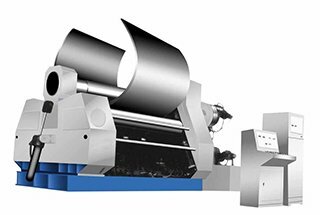 According to the principle of three-point forming, the rolling machine makes use of the relative position change and rotation motion of the working roll, so that the sheet can produce continuous elastoplastic bending to obtain the workpiece with predetermined shape and precision. 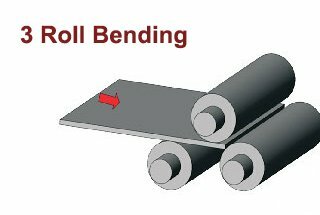 The structure of four roller plate bending rolls as shown in figure 1, it is mainly composed of low frame, overturn device, upper roller, lower roller, two side roller, high frame, connecting beam, base, balancing device, transmission device, electrical system, hydraulic system, etc. 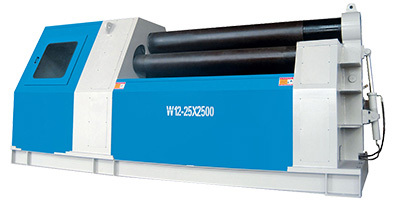 The working roll of the four roller plate rolls consists of four rolls: upper, lower and two side rolls. The upper roller is the main drive roller, which is embedded in the high and low frame through the bearing body, and its position is fixed, so it can only do the rotary motion. The lower roller is fixed in the bearing pedestal. In order to compensate for the thickness of the bent plate, the bearing pedestal can do the straight line movement in the sliding guide groove of the frame. The two side rollers are installed in the bearing pedestal. 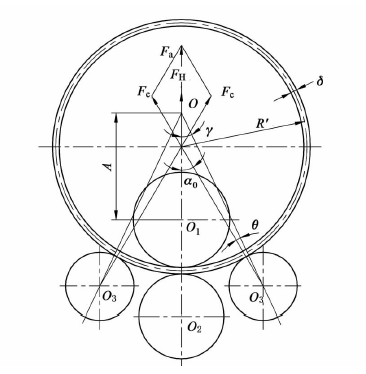 In order to obtain the specified radius of cylinder curvature, the side roller bearing pedestal can move up and down in the direction of a certain angle with the vertical direction. During rolling machine operation, first place the front end of the bending roll plate between the upper and lower roller, and align the center (lift one side roller, aligning plate end and side roller), then lift lower roller to press the plate tightly and lift the other side roller to apply force which make the end of the metal plate bending. 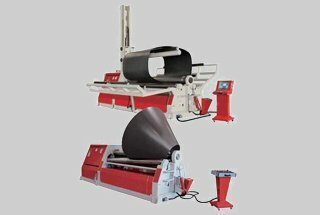 When pre-bending the other end of the plate, the metal sheet does not need to take out from the rolling machine. Move the plate to the other end of the machine and pre-bending with the same method. Finally, do the roundness corrections in order to get required roundness and cylindricity. Thus it can be seen that when bending the plate with four rolls, it is necessary to put the plate into the rolling machine only once to achieve the purpose of all the bending rolls. As shown in FIG. 2, the stress distribution of the plate section along the direction of steel plate height during the linear pure plastic bending is shown in FIG. 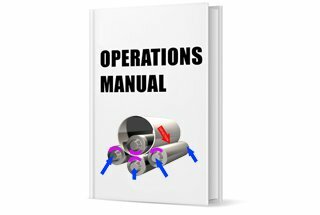 2.
ε – The linear reinforcement modulus of the material, can be found on the relevant manual. 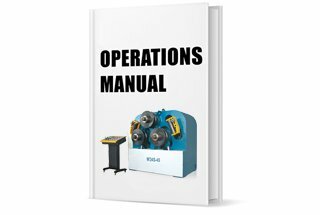 K0 – The relative strength modulus of the material, can be found in the relevant manual. In above formula:ｂ– The maximum width of rolled sheet steel plate. 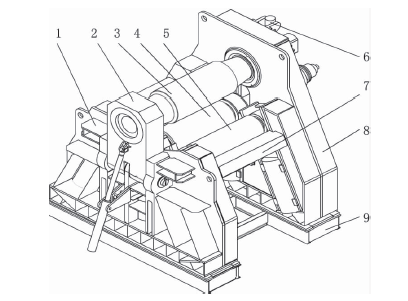 Rollers are arranged in a symmetrical arrangement and asymmetrical manner. Therefore, it is necessary to do the force analysis of the four-roll machine separately. The force of the steel plate is shown in FIG. 3. Fa – Upper roller plate rolling deformation force. α0 – The angle between the force action line of the side roller and the force line of the upper roller. A – The distance from the intersection point of the roll angle to the center of the upper roller. 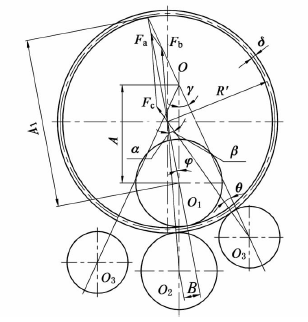 The force of the steel plate is shown in FIG. 4 when the roller is arranged in an asymmetric manner. β – The angle between the force action line of the upper roller and the force line of the side roller. 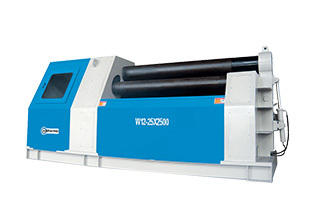 The upper roller of 4 rolls bending machine is driven roller. 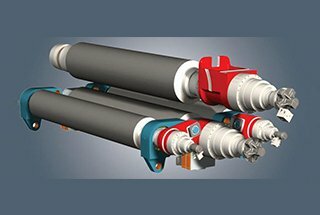 The total drive torque acting on the upper roller is adding up the torque consumed on the deformation and overcome the friction. 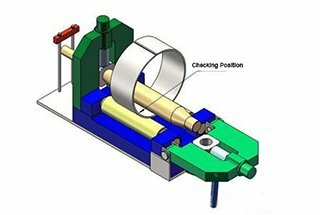 Friction torque including frictional resistance consumption to overcome shaft roller rolling on bending plate and torque consumption in the roller bearing friction. The torque that is consumed in the deformation can be determined by the work done by the bending internal force and by the force equal to the external force on the upper roller. L – The bending Angle corresponds to the length of the plate. The torque for overcoming friction can be determined by formula (19) and (20). da, db, dc are the roller neck diameter of the upper roller, lower roller and side roller separately. PJ – The driving power of the driving roller when rolling circle. 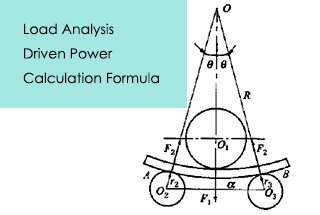 The calculated value Pq of the driving power can be used as the basis for selecting the main motor power. (1) According to the structural characteristics and working principle of the four rolls plate bending machine, the force of the working roller is analyzed, and the calculating formula of the working roll under the different arrangement is obtained. (2) On the basis of analyzing maximum deformation bending moment and the bear force of working roller, combining function transformation principle, to establish the relationship between the force, bending moment and device driver power, and put forward a method to calculate the driving power of main drive system. According to the actual application conditions, the driving power of the pre-bending and rolling is calculated respectively, and the main motor power is selected based on the larger value of the calculated results.